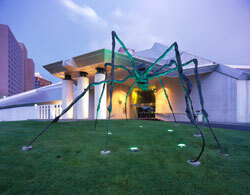 At the Kemper Museum of Contemporary Art, you will find works by modern and contemporary artists from around the world. Since the Kemper Museum's opening in 1994, its permanent collection has more than tripled. Works in the collection range from those created after the 1913 Armory Show, an important benchmark in modern art, to the present. Visitors to the Kemper Museum discover works in all media by renowned modern and contemporary artists as well as works by emerging artists. Permanent Collection artists include Polly Apfelbaum, Arthur Dove, Louise Bourgeois, Dale Chihuly, Damien Hirst, Andrew Wyeth, Fairfield Porter, Georgia O'Keeffe, Frank Stella, Lesley Dill, Romare Bearden, Christian Boltanski, Robert Mapplethorpe, Nikki S. Lee, Kojo Griffin, Matthew Ritchie, Wayne Thiebaud, Petah Coyne, Tom Otterness, and Hung Liu. The Museum rotates its collection on a regular basis, allowing visitors to study and discover new works throughout the year.